Movies that are destined to be updated, or remade. Temujin, later Genghis Khan: If we had not run but stopped and fought Jamuga, none of us would have to be here now. None of us! Temujin, later Genghis Khan: [At Subotai] You have a strong right arm, Subotai, and I like to know it is at my side. But your mouth is young and needs training. Temujin, later Genghis Khan: With enough training, my brother, you may yet become my strong right arm, for I have need of another! Why Worry About Authenticity? Enjoy! Historical accuracy is not very likely in an epic like this, but that's not the point, especially after so many years have passed since it was made. 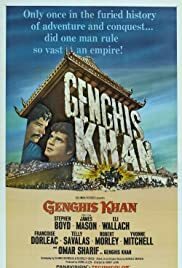 Considering 'Genghis Khan' now, it stands out as a dandy museum piece, not only in the 'they don't make 'em like this any more' category, but because it's such a full-blown try at making a splash in the epic film sweepstakes of the 1960s. Yeah, it's a tinker-toy epic, but great fun, despite aiming at serious drama. Only 'Marco the Magnificent' outdoes it for 'Mutinational Production Prize' of its era. Interestingly, it's a 'gap-filler' epic. That is, in the years when every ancient or legendary subject/culture seemed to be tackled by producers, hoping to strike 'Ben-Hur' gold, filmmakers shopped around history, looking for unique subjects to make an impression. Sooner or later the great Khan's number was going to come up. 'The Conqueror' with John Wayne seems more like a western (duh! ), while 'Genghis' actually has a central Asian feel to it. Like its mate, 'The Long Ships', this is a Yugoslavian-filmed venture, a mini attempt to emulate Sam Bronston's epic production efforts over in Spain. After Bronston's great empire unfortunately folded, other attempts to take up the epic gauntlet were made. This is one of the most sincere. A great cast, pretty respectable art direction, a sense of epic sweep, and a predictable but often witty script, they're all here. I'm sure the distinguished cast did it for the money, but at least they probably had a good time doing it. At its best it's a decent try at being epic. At its worst, it's a curiosity, but a pretty amusing one. Highlights: - Dusan Radic's fantastic score. He achieves a Rosza-like standard, I think. Michael Hordern yelling 'TEMM-U-JEEN!!!' endlessly. Omar Sharif's yoke. Enthusiasts can see who wears his longer: Omar or John Wayne. James Mason's Mandarin parody. Politically correct it ain't. Bob Morley steals the show (as usual), as the effete emperor. The only character in cinema history who is killed just by WATCHING fireworks. Best line, as he hands a featherweight fan to a servant: 'Take it, it grows heavy'. Orson Welles WASN'T in this one, but should have been. Francoise Dorleac is of course very Euro, but not bad to look at. Any picture with Geoffrey Unsworth behind the camera is going to have some stuff going for it. Seeing it in full Panavision on the big screen would certainly give this picture more respectability. I await its' much-deserved DVD appearance.